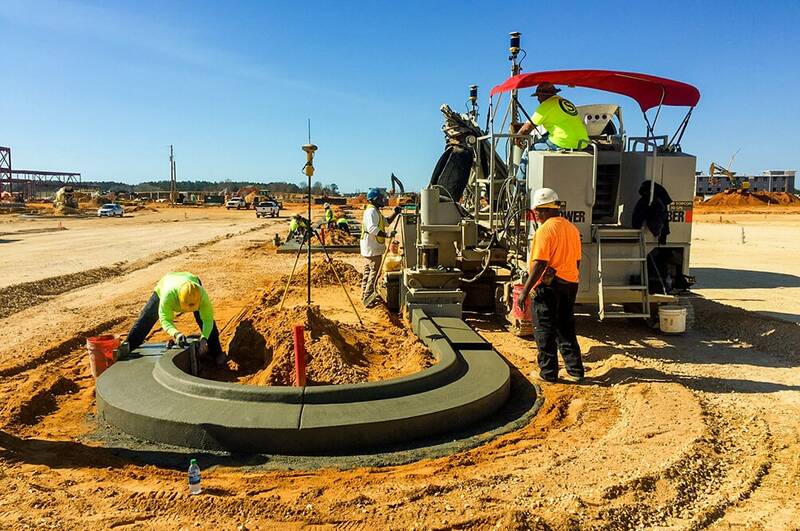 Cunningham DeLaney Construction, a turnkey civil and utility contractor located near the Gulf Coast of Alabama, has been building infrastructure for over 16 years. 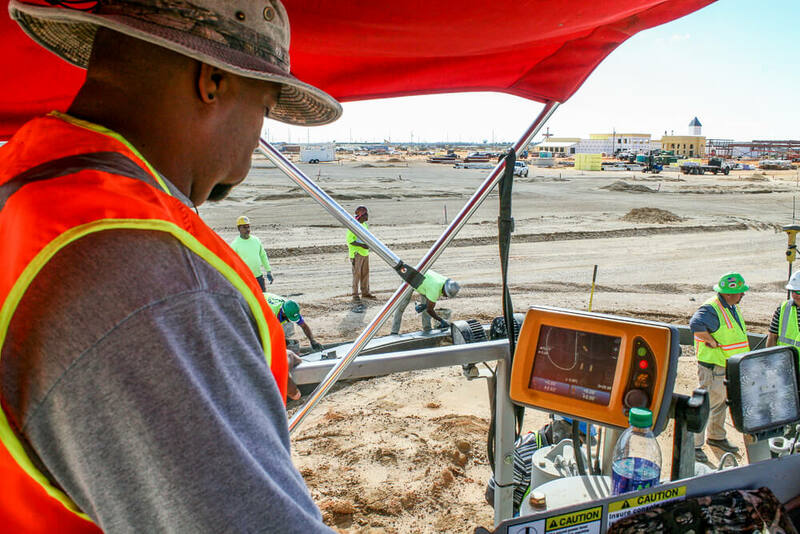 For several years, Cunningham DeLaney owned a slipform machine but sold it during the recession that began in 2008. 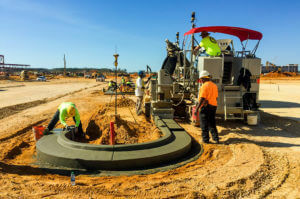 Until 2015, most of the company’s concrete curb work was subcontracted. When the economy got back in full swing, owner Jacob Cunningham decided to purchase another machine. This time, he purchased a Power Curber 5700-C outfitted with TopCon Millimeter GPS controls. 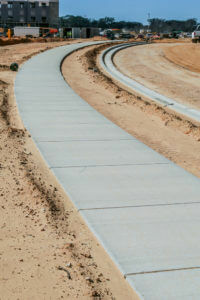 He wanted something completely different than the machine setup he had previously owned, and he didn’t want traditional stringline to be a part of his new concrete operation. In the summer of 2015, Cunningham began utilizing GPS technology to pour curb stringlessly. Once in a great while a contractor wins a landmark job. 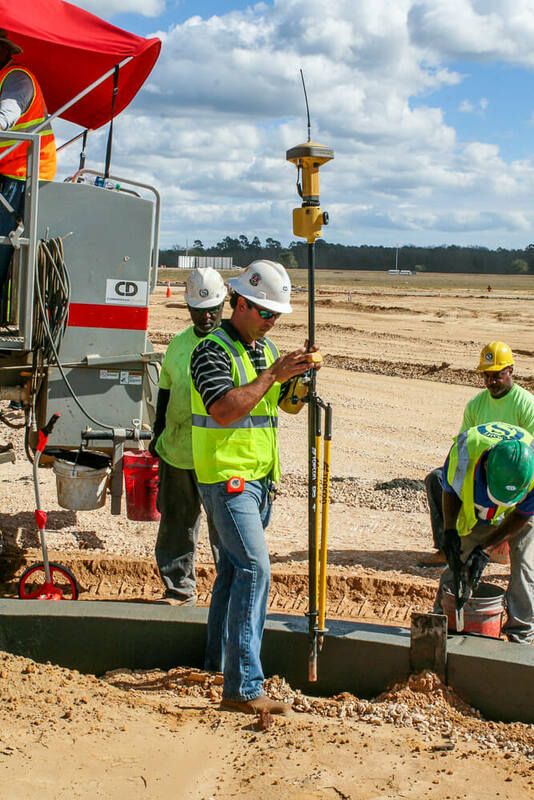 For Cunningham DeLaney, that job was the new OWA amusement park and hotel complex in Foley, AL, being developed by the Poarch Band of Creek Indians. Cunningham DeLaney worked directly for the owner as the contractor in charge of infrastructure for the project. 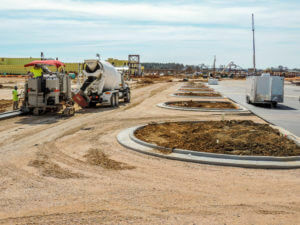 The more than 300-acre development includes roadways and parking lots with 55,000 linear feet (16,764 m) of curb and gutter, over 100 islands, and 25,000 linear feet (7,260 m) of 5-foot (1.5 m) wide sidewalk. 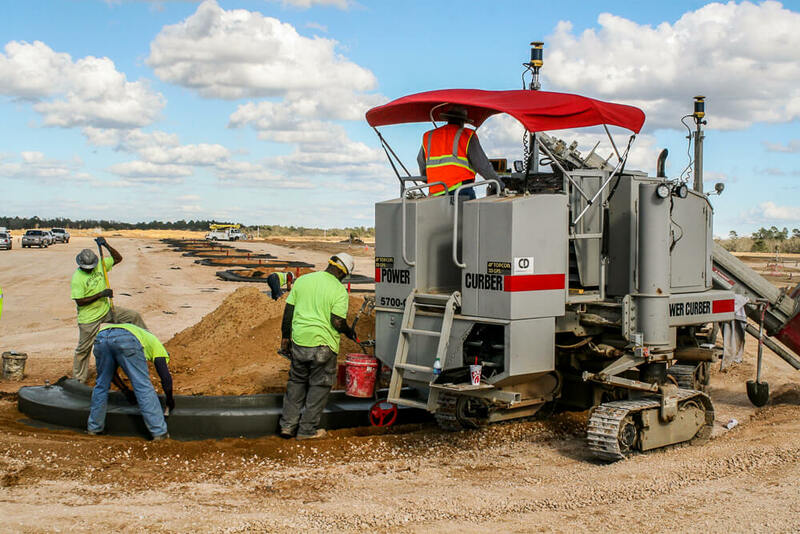 Having broken-in their new 5700-C on numerous projects over the previous year, Cunningham DeLaney took on the massive job without a stringline stake in sight. 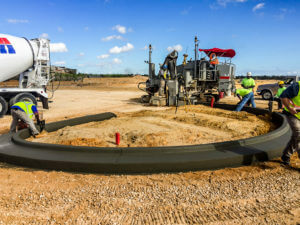 The real value of pouring stringlessly became evident as the moved from island to island without time wasted setting string and without the stringline interfering with trucks and other equipment as they moved around the jobsite. Cunningham DeLaney completed the majority of the curb and sidewalk portion of the job in early 2017, well ahead of schedule, allowing paving crews to move in earlier than expected. 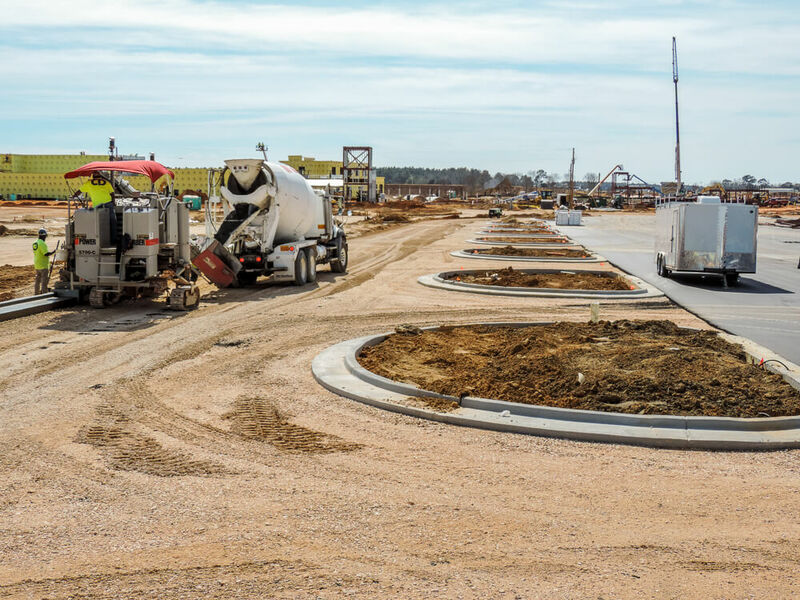 With the opening of a hotel, several restaurants, retail spaces, and an amusement park all depending on the completion of Cunningham DeLaney’s infrastructure work, every day was critical. Cunningham DeLaney has succeeded in staying well ahead of the other portions of the project and is only weeks away from full completion. 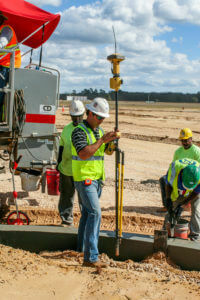 Cunningham DeLaney, Power Curbers, and Topcon form a capable team that has contributed to the success of the very significant OWA entertainment development – a venue that is expected to attract one million new visitors to the area and is projected to increase tourist spending by 7% in Baldwin County.